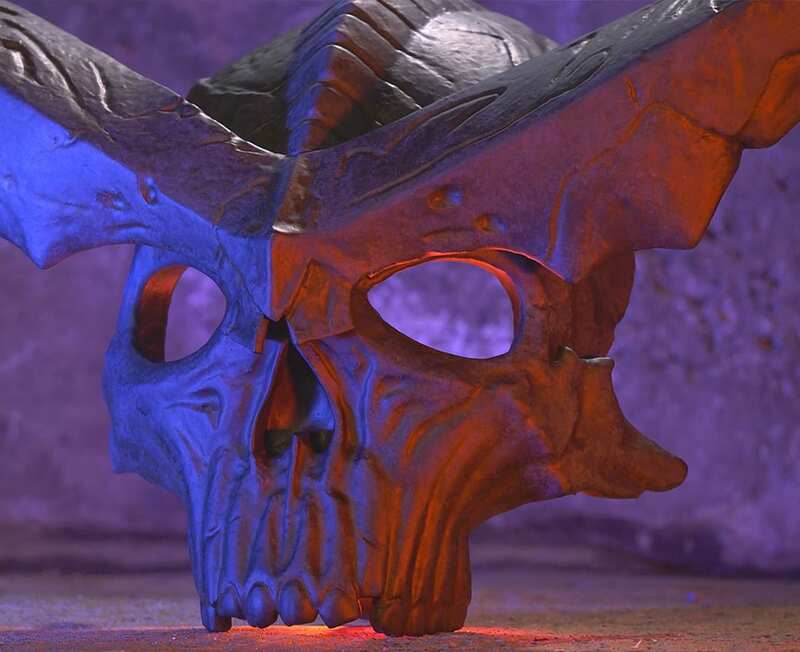 Using EVA foam and a rotary tool, Britt carves her own version of Surtur’s skull-like crown from Thor: Ragnarok. 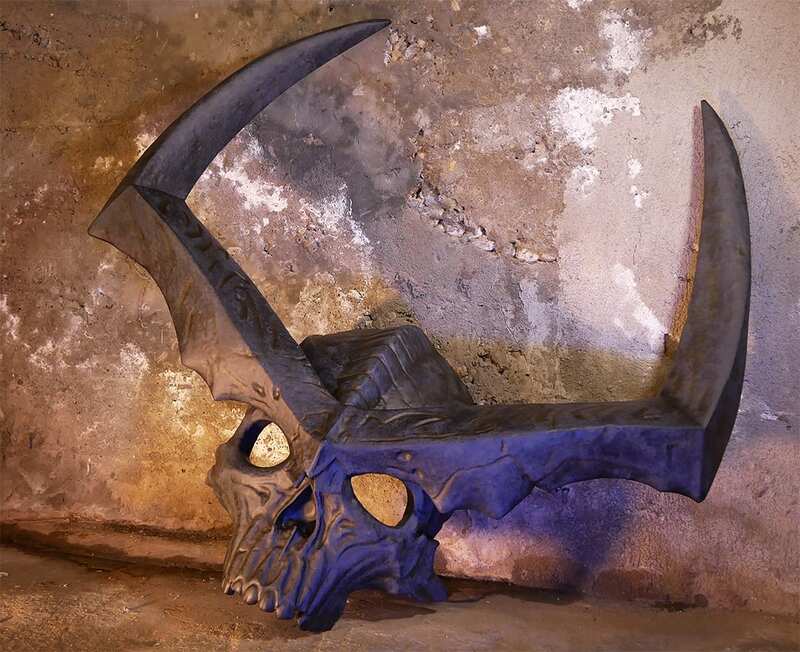 The base for the skull and horns were made twice–to create foam-friendly templates for this large, organic prop. Check out our other free blueprint files here. These files will download in a .ZIP folder, since they’re multiple pages. Open the .ZIP folder to unpack your files. Make sure the download is complete before opening or moving the file, which may corrupt the files. We like to use Adobe Reader to view the .PDFs and print the blueprints. I split up the templates into multiple pages for printing on Letter size printer paper. When you choose to Print, make sure to uncheck any “scale to fit” options and choose “actual size” in the print settings. If you’d like to print the files on a different size printer, I included a Full Page version of the templates that isn’t split up. In Adobe Reader, there’s a “Poster” option that will automatically split up the large print into the chosen paper size. The horns are about 35 inches (89 cm) wide. If you’d like the whole prop to be bigger or smaller, use Adobe Reader and change the Full Page template’s scale. Then, use the “Poster” option to split up the pages for your printer. Clean foam cuts make this build much more fun! Check out this video on how to keep your knife sharp and for some cutting advice. For the Surtur template, quite a few of the cuts are at angles. Make sure to reference the key that comes with the template and explains the different dotted lines. Also, think about how the templates will fit together before cutting out all the pieces in foam–just to be sure the foam cuts make sense. You can totally skip the foam trench cuts that are on the back of the teeth. That method looks great for subtle curves, but the organic skull details need a lot of rotary tool carving. Contact Cement is my favorite way to force EVA foam seams together. Super glue could also work, but can be difficult with these large foam pieces. If you use super glue, attach one small section at a time, using as little glue as possible and wipe away any glue squeeze out. The same goes for hot glue–work in small sections and press the pieces together until the glue is fully cured. Check the fit of each foam piece before adding glue. Some extra foam may need to be cut away to make everything fit together nicely. This template is still a prototype and doesn’t fit together perfectly, so it’s normal to have to modify pieces. The epoxy Epsilon Pro worked well for this build, but it’s not the best material for every project. If you have questions about the product, check out Smooth-On’s website. Also, they’re great about responding to material questions through Twitter. Including my small-scale tests, I almost used an entire trial size container of Epsilon Pro. (1.44 lbs. / 0.65 kg.) I brushed on two layers. The first layer was 120ml of Part A and 60ml of Part B. I mixed the same amount for the second layer, but ended up with extra that I brushed on test pieces. To avoid brush hairs in the finish, make sure to superglue the bristles to the handle attachment. The epoxy filled in my seams and any small texture details. This can be a problem if you want small details in your project. For a more textured look, you can use a PVA Glue, such as Mod Podge. While the glue is drying, tap the brush bristle edges against the surface to add a stippled look. For more finishing options, check out our foam sealing guide. My paint finish can be scratched off–revealing the grey-tinted epoxy below. I haven’t clear coated my acrylic paint layers, yet. The prop will need some kind of clear coat protection and I’ll probably use a Varnish. As long as it’s a light application, Varnish is pretty flexible. With unfamiliar material combinations, always do a small scale test first. We have an Artlist music subscription.